giga-pneumatiky.sk is known for offering an impressive selecting of scooter tyres. Find some of the best tyres that can help boost the performance of your new bike no matter what speed you are going. Michelin scooter wheels are not the only option. Quality tubes make these tyres fit for almost any road. If you have just purchased a scooter to avoid early morning or evening traffic, we can provide you with quality tyres that will keep you safe. After all, it might be time to change your tyres if you are riding your scooter or moped every single day. These tyres were made for city conditions and offer excellent grip, which will keep you driving safely. From Avon to Dunlop and Duro, we have partnered with a plethora of different brands. In turn, we are able to offer you scooter wheels for every taste and budget. 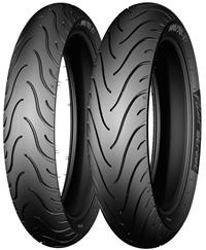 Our extensive range covers tyres for most scooters that are currently available on the market. You can even shop tyres for several big-wheeled scooter models and count on the great deals that we offer you. If you are looking for free delivery, we most likely have you covered as well. Most of these tyres will be just effective for all of their running life.